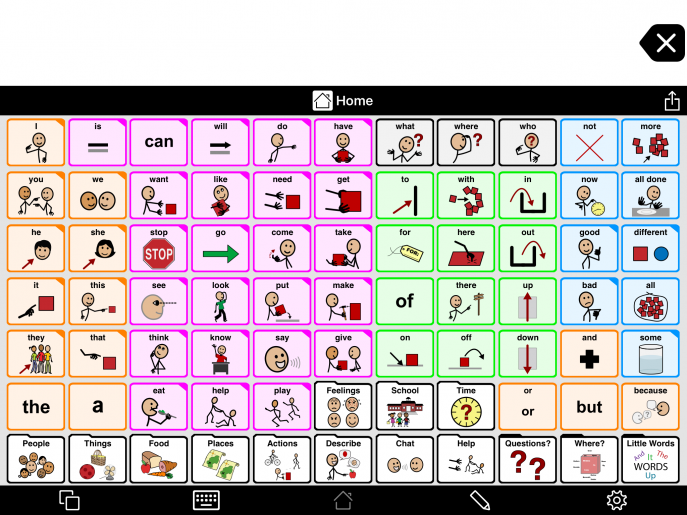 AAC is short for Augmentative and Alternative Communication. Communication systems, strategies and tools that replace or supplement natural speech are known as augmentative and alternative communication (AAC). These tools support a person who has difficulties communicating using speech. The first “A” in AAC stands for Augmentative Communication. When you augment something, you add to it or supplement. Augmentative communication is when you supplement your speech with something (signs, symbols, a letter board, for example) to make your message clearer to your listener. The second “A” in AAC stands for Alternative Communication. This is when you are not able to speak, or your speech is not understandable even when you add something to it. In this case, you need a different way to communicate. Basically, AAC are the tools, systems and strategies that help a person communicate when they are not able to communicate effectively using speech. There are many reasons why a person may not be able to communicate using speech. They may have a developmental disability which has affected the person’s development of speech. They may have an acquired disorder that has affected the person’s ability to speak. Communicating without speech can lead to frustration for many people. Both the non-speaking person and their communication partner can become confused and frustrated when messages cannot be conveyed effectively. Often a non-speaking person will have many thoughts they wish to communicate, but there is no way to get these thoughts out. When a person is not able to speak, others often make judgements about their competence, potential and ability to think and learn. A person who does not speak will quickly learn that some things are easy to communicate (e.g. reaching for the TV remote to suggest you want to change the channel), and some things are hard (e.g. that the TV show reminds you of a family member who is gone). What types of AAC are often used? AAC incorporates all the tools and strategies a person can use to communicate when they are not able to speak. Aided AAC – or AAC that uses tools or materials. Generally, when we are setting up for AAC, we may use a high-tech tool (e.g. 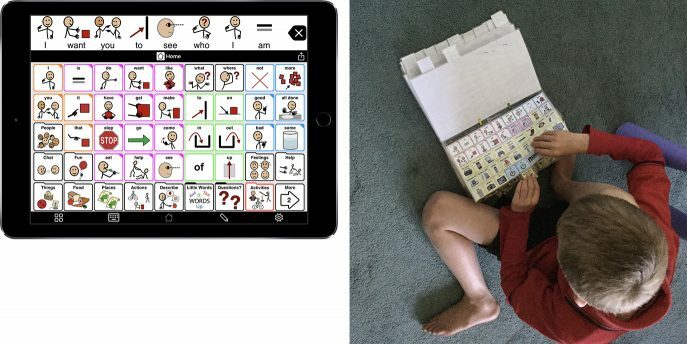 a Speech Generating Device, or AAC app on an iPad), or a light-tech/paper-based tool (e.g. a communication book, or board). Many people who cannot speak are not yet literate. We introduce these users to visual symbols that represent words or maybe phrases. Proloquo2Go is AssistiveWare’s symbol-based AAC solution. An AAC system may be a text-based system with a keyboard. This is generally for a person who cannot speak, but has developed or retained effective literacy skills. 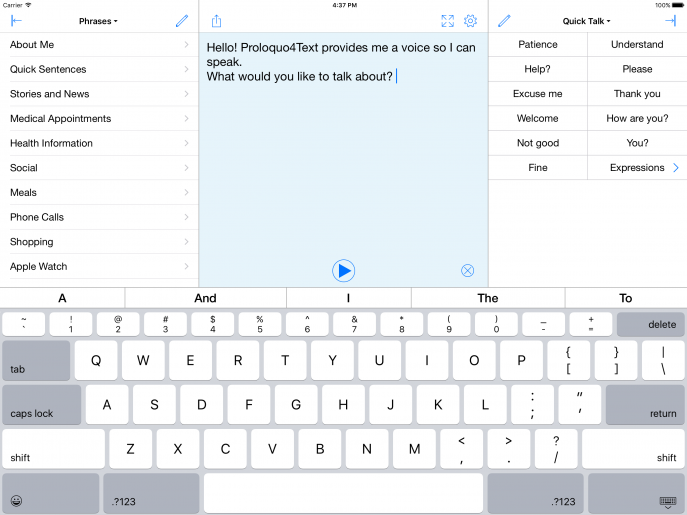 Proloquo4Text is AssistiveWare’s text-based AAC solution. Many people who cannot speak but use AAC are multi-modal communicators. This means they have multiple ways to communicate their messages. Maybe they use a combination of vocalizations and word approximations, some gesture and signs as well as an AAC system. All different methods of communication should be valued and respected. Any communication will tell us something about the person and the situation. Just because a person has some spoken communication in the form of words or vocalizations, it does not mean that they should not be eligible for AAC. Giving a person with limited speech, an AAC system will give them more words and language, and the possibility of communicating far more than they can with speech alone. When a person cannot speak, giving them more tools to communicate their thoughts and ideas, desires and wishes is truly powerful. Speech therapists, educators, and families often report additional benefits. These include increased speech production or attempts at spoken words, stronger relationships with family members and caregivers, improved receptive language comprehension, and more. Conversely, there are often difficulties seen when AAC is not introduced. AAC is simply a tool that supports people who cannot speak. But communication is always a 2-way street, an interaction between two or more people. Families, friends, school teams, co-workers, physicians and others all benefit from training and guidance on how to be a good communication partner to people who use AAC. Communication partner training includes learning how the person who uses AAC wants to be supported. Communication is a fundamental human right. A person with communication difficulties may find their voice with AAC. Before starting the AAC journey, you may still wonder whether AAC is really needed. Will AAC be beneficial? When should we consider AAC? If you need help answering these questions, please check the “Do we need AAC?” article. If you wish to see where you are in the AAC journey, to make plans to support change and progress, please use our Learn AAC Guide. This may help you to consider selecting the right AAC system for a person, getting set up for AAC and then helping to build language and real communication. Good luck, please reach out to our support team if you need any help along the way!